Your eyes may be the window to your soul, but your mouth can often tell your dentist what’s going on with the rest of your body. The links between oral health and overall health are many , dental and other experts now concur. That’s especially true if you’re an aging baby boomer who may be susceptible to serious health problems such as heart disease and diabetes. Over the years, dentists have changed the scope of their exams partly to catch such diseases in their early stages, says Dr. Dora Skoura - director of SkourasDent. 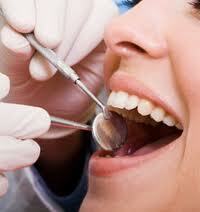 A look in the mouth by a dentist, she says, can yield a lot of valuable health information. However, many people aren’t taking advantage of this knowledge, according to a recent survey of nearly 500 Greeks, aged 45 to 64, that was commissioned by the practice. While 78 percent of those polled say dental care is a vital part of preventive health care, 49 percent admitted they don’t visit the dentist every six months as recommended. And 31 percent are in the “kicking and screaming “ category - - either they go to the dentist if they have an emergency, such as a terrible toothache, or they never go. These lapsed patients may be surprised to find out that the modern dental exam has changed quite a bit. “The exam has changed mainly because of two things”, Dr Skoura says. One is more awareness of cancers of the mouth, which dentists now screen for. Another is the growing consensus that a good dentist can help you keep not only your teeth but your overall health in good shape ,she says. “We are asking more questions of our patients”, Theodora says. Many dentists now ask about your saliva quality, what medications are you on, the date of your last physical, and other questions that may not seem to have anything to do with your teeth. From the patient’s answers, and their own observations, dentists can piece together conclusions about the patient’s overall health- - and perhaps suggest that a physical exam is also in order. Dora often hears from her boomer patients , for instance , that they have a burning or sour taste in their mouth. After investigating further ,she often suspects they have gastroesophageal reflux disease ,or GERD, in which stomach acid splashes back up, and refers them to a doctor. The condition can be treated with medication. Bad breath or bleeding gums can be a symptom of adult onset diadetes. So can dry mouth and receding gums. Dentists can also tell if you are stressed by examining the mouth, says Dr. Skoura. One telltale sign of stress is bruxism,the grinding or clenching of your teeth, says Dora, who tries to educate the public about the oral health-overall health link. “Occasionaly, the tissues of the mouth will change. Patients may have red spots on their tongue, which can point to immune-related disorders” ,she adds. Oral inflammation that doesn’t subside is another red flag ,Dora says. ”If you are immunosuppressed, have leukemia or AIDS, you will have things in the mouth that don’t look right, such as ulcerative lesions or gum inflammation”, she says. What about the gum disease – heart disease debate? “There’s been a lot of controversy ” Dora says. Some research says the two are linked ,while other studies refute the association. “My feeling is ,if someone is not taking good care of their mouth they will have gum disease and they are probably not taking good care of the rest of their body, either,” she says. And as saliva production decrease with age- - and it begins Dora says,around age 50- - the incidents of cavities around the roots of teeth increase, setting up some boomers for a whole new round of cavities. It’s easy to put off the routine trip to the dentist every six months. But dentists urge their patients to think of it not just as a drill-and-fill appointment, but a health check-up.